If you are a Star Trek fan in search of a table top lamp then check out this Star Trek transporter lamp. 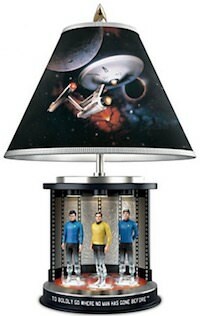 The lamp base shows the Transporter room and Captain Kirk, Mr. Spock, and Dr. McCoy are being beamed away. And the lamp shade shows the Starship Enterprise flying in a galaxy and all that together makes for a real unique piece a true Star Trek fan just needs to own. And beside the light that is included with the lamp, even the base can light up to make the whole Star Trek experience visible. So if you want a cool lamp on your desk, table, or nightstand then this Star Trek lamp could be the one.